Imagine if you will the most fanciful, delicate, and flawlessly gorgeous confections. Think Marie Antoinette decadence; quintessentially luxurious desserts. That is the essence of Lady M cake boutique in New York. 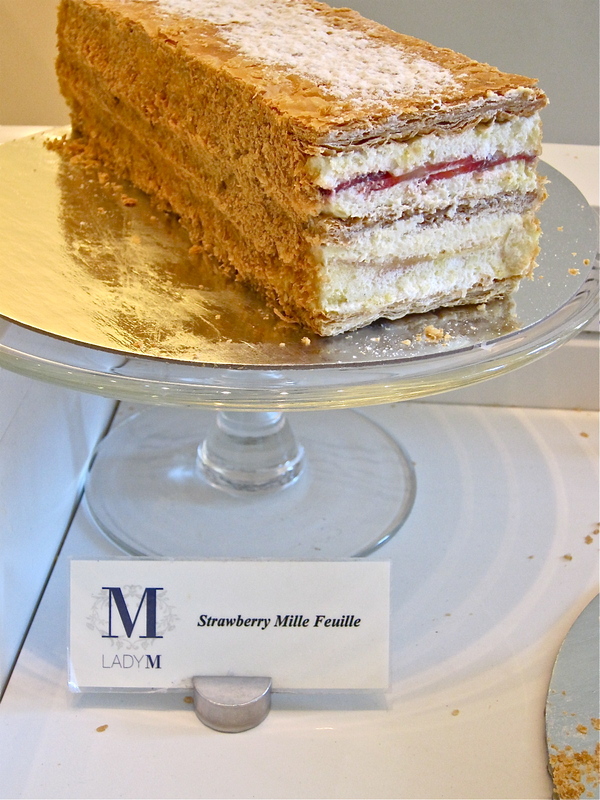 Lady M is not your average bakery. It is dainty, pristine and, well, just perfect. The small space is fabulously unspoiled, with white walls and gracefully minimal décor. The display of desserts is so masterfully presented you dare not slice into the cakes for fear of damaging their idyllic nature. 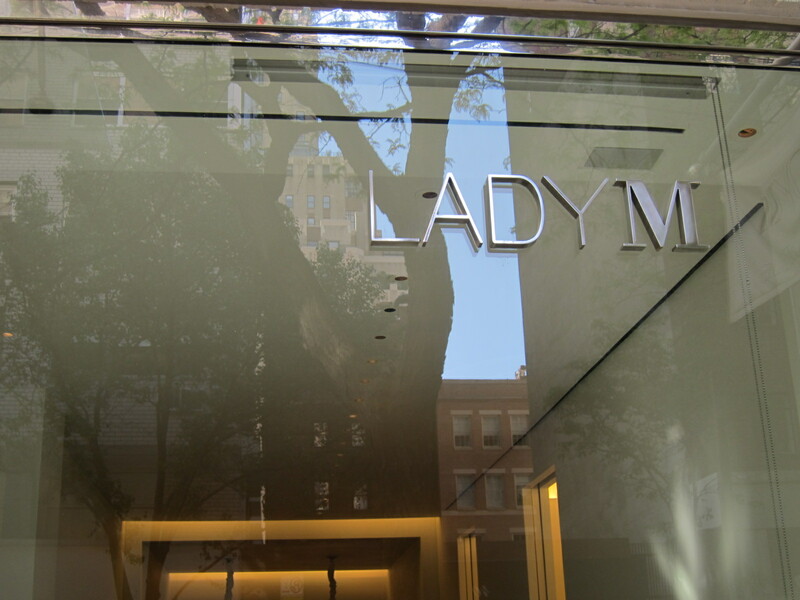 My trip to Lady M was an unplanned surprise. On my first afternoon in the city I met up with my friend and fellow blogger H.C. to embark on a dessert adventure. 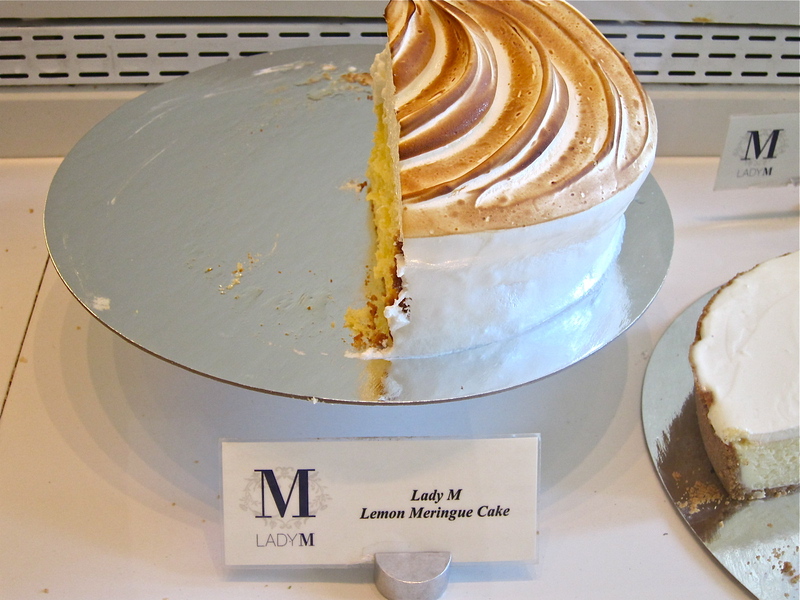 With so many options available, it was hard to narrow down a location, but a helpful recommendation led us to Lady M.
Lady M offers a large selection of cakes to choose from. Be prepared that while these may be the most splendid desserts you may ever have, they are quite pricey. 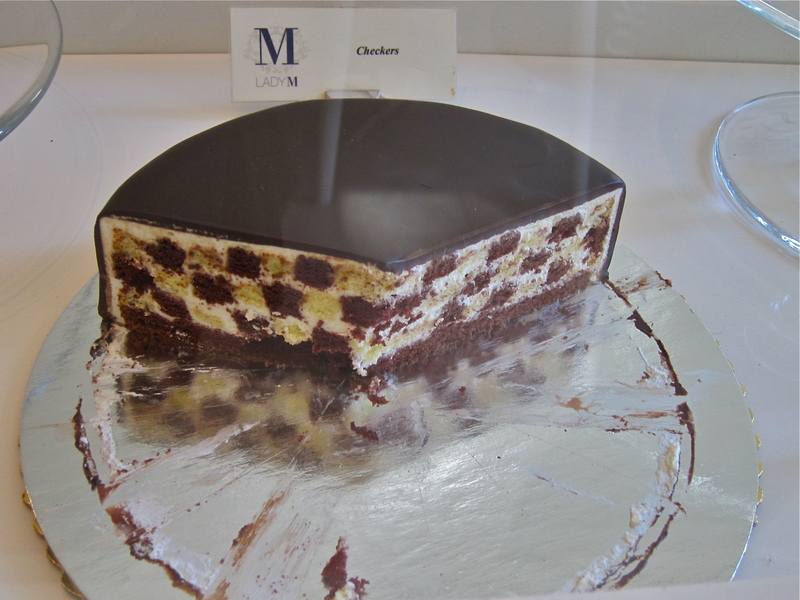 H.C. ordered Lady M’s signature cake, the intricate mille crepe. 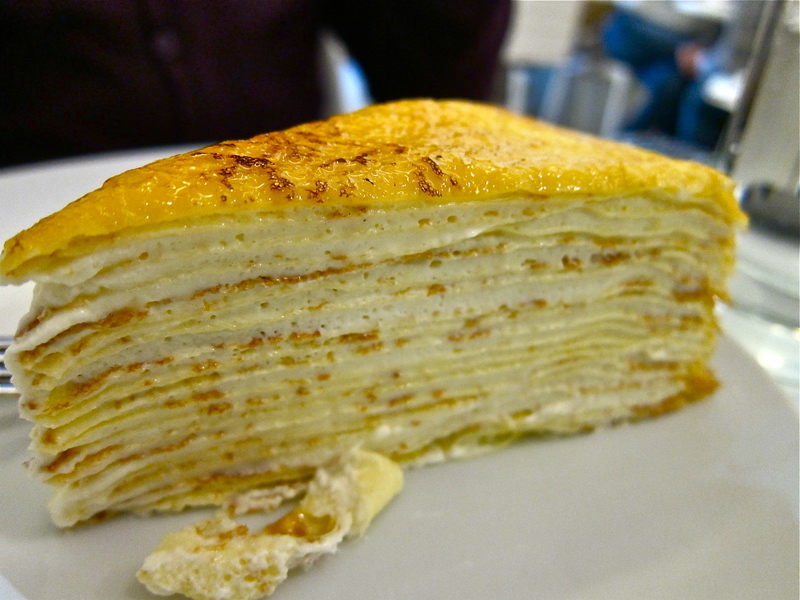 This cake is comprised of no less than 20 paper-thin hand made crepes layered with ethereally light and creamy custard. Its many accolades are well deserved. It has a gentle, mellow flavor that is all together sumptuous and dreamy. Each fold melts in your mouth. 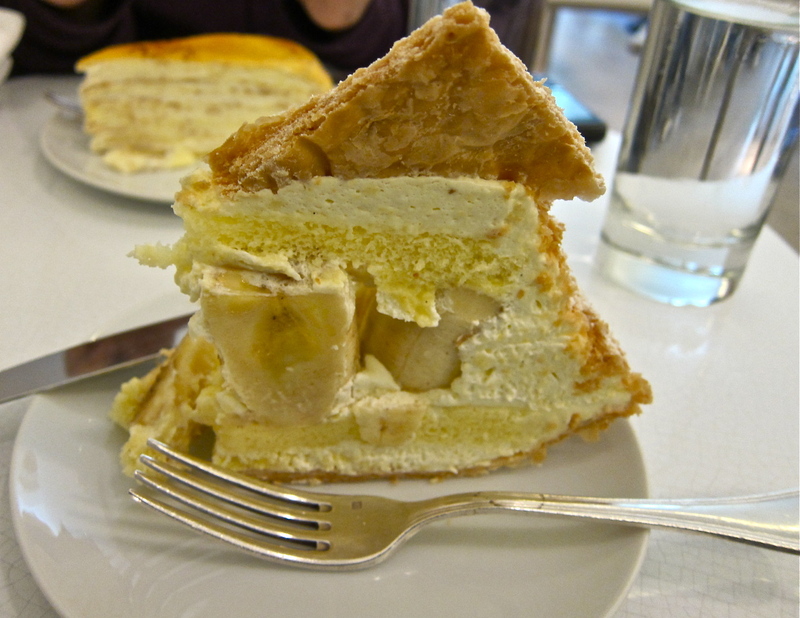 I ordered the banana mille feuille. This capricious cake was a bit difficult to eat given the height of this masterpiece, but I dove right in. Layers of puff pastry snuggle against airy pieces of sponge cake. In the center is silky custard and fresh bananas. 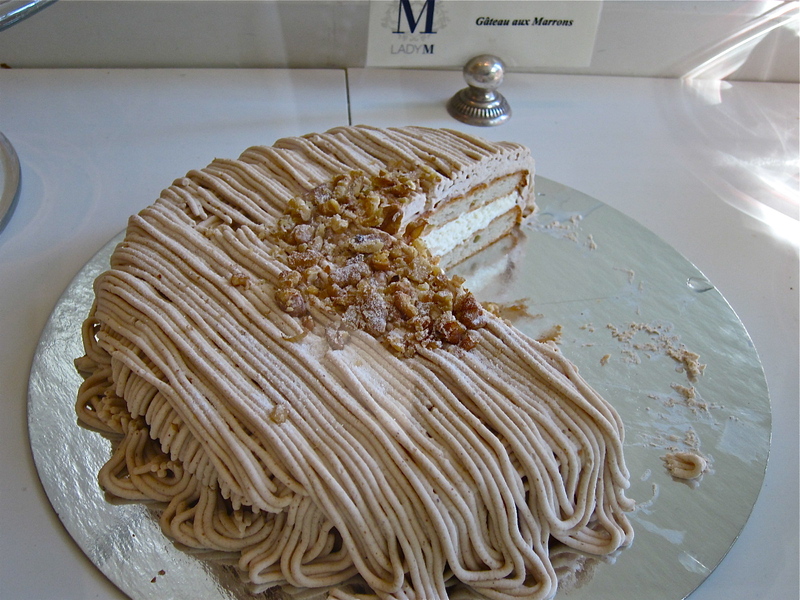 It is modestly sweet and decadent – a little slice of heaven. It was the perfect day of indulgence. Enjoy some pictures of their delicious cakes! Why: Because everyone needs a day of indulgence. Have your cake and eat it too! Previous PostPrevious Hill Country Chicken – Home of the Pie Shake! Oooh, I love cake! All of them look marvelous but your and H.C.’s orders are spot-on. The mille crepe looks light and airy, while the banana mille feuille would keep me sated for the rest of the day (until after-dinner dessert, natch!) Thanks for sharing! Wow, that mille crepe does look amazing! I may have to go next year, even if it’s far from where I normally stay! I’m so glad I discovered you, well, because now I get to discover all these incredible places in NYC when I visit! Hooray! Tracy- the banana mille feuille did he me sated all day sooo sooo good! Fiona – it is kinda far but so worth it! i cannot even fathom how one would so precisely layer all those crepes! looks insane!